A modern organization’s PMO can directly support and assist with the management of projects and programs in an organization, and to provide training and coaching to the individual project managers on how best to do that. Here’s how to get started from nothing. First, let’s start with the goal in mind. There are different types of PMO, some more supportive or advisory than directive and controlling. Some do not have direct authority over the company’s PMs to adhere to the guidance and processes that are created and advocated by the PMO, which risks contributing to an ineffective organization. 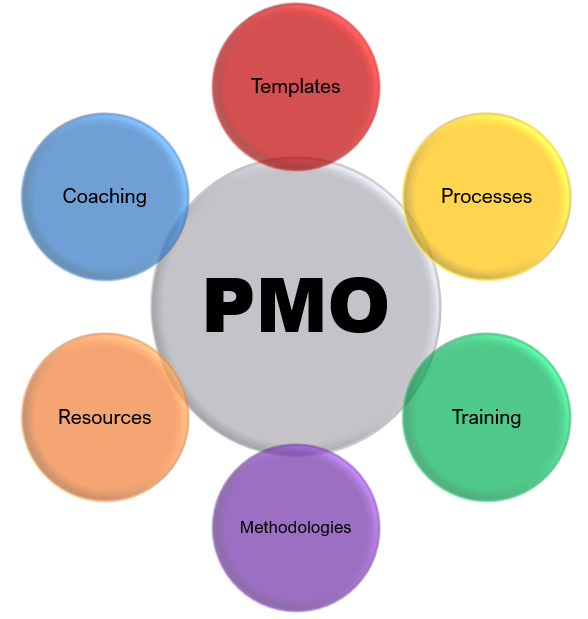 You want to establish a PMO organization that is centralized, accountable, and authorized . The PMO needs to be a mechanism that can provide guidance and influence with authority. I am assuming you have the support from upper management to form a PMO, which would be the result of a perceived need or honest discussion about establishing one to help the business. PMOs are as strong as the mandate they have from management, so make sure they have a good mandate! A key benefit (and maybe the most important one for the PMO’s long-term survival) is to provide upper management with a consolidated view of all the projects an organization is undertaking, showing both their current status and their risks. I will cover this type of Project Portfolio Management (PPM) tool in more detail in a future article. Having some type of regular reporting through a PPM for upper management is the capstone of establishing the processes and procedures to run an organization’s projects consistently and effectively, so keep this goal in mind as we begin. The key first step, and one that also can have an immediate impact on a organization, is to provide a set of standard templates that can be used to manage a project. 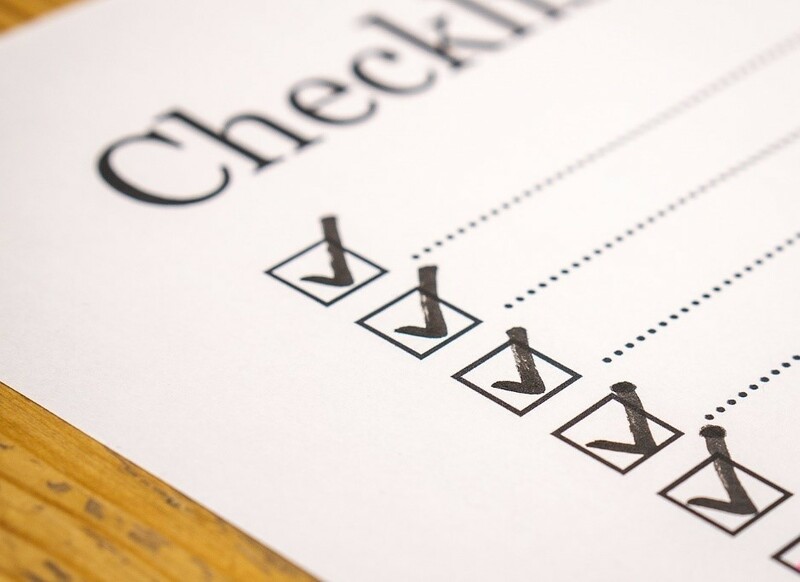 These will cover all aspects and all phases, from a Kickoff Checklist to a Project Closure Checklist, and will include all the “artifacts” and collateral typically created by a PM in the course of running a project. Some people advocate first establishing an organization strategy, or a PMO’s mission and vision statements, but I favor a start from the bottom-up. Understanding how the actual work of PMs can be improved will (in my opinion) better inform the strategic focuses of the PMO and the organization than starting from a top-down approach. Here is the list of the standard templates I typically create for a PMO. For each template, I provide the purpose and the format it can come in. I favor Microsoft’s Office document types because that’s what I am most familiar with, but you can also use Google or Apple’s versions if that’s what you or your organization uses. 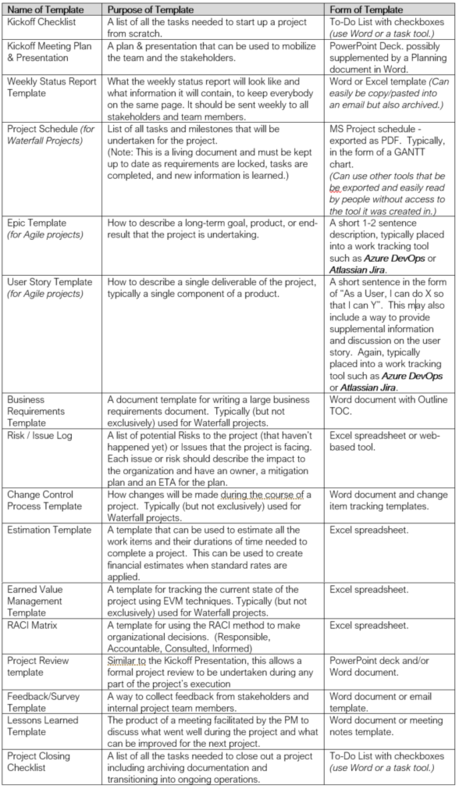 I also have included templates for both Waterfall and Agile methodologies, so if your organization doesn’t use both, just create the set you will use. Communication plan including standard meeting schedule and status reporting cadence & procedures. Initial action items for everybody in a project work tracking tool. This can be an initial unveiling & demo of the tool. For the Epics and User Stories, these are examples of how to write them, as opposed to real ones for a project. So you may want to put these examples and supporting narrative into a reference Word document or wiki page, so that PMs can refer to them when creating the real Epics & User Stories in the work tracking tool (Azure DevOps or Jira).